Disclosure: I received a Crafters & Co. set for the purposes of this review. All opinions are my own. With less than two weeks until Christmas, the countdown is certainly on – and boy am I feeling the crunch! Although I have the majority of my shopping done, I still have a few last minute gifts to grab and I still need to wrap it all! I have not started my Christmas Day menu plan and I still have a boat load of blog posts to write for the blog! Tie all of this together with my kids sports schedules, holiday concerts at school and a few appointments thrown into the mix, and I am having a hard time figuring out where I am going, let alone what I need to do next! Can anyone else relate? I certainly could use some stress relief right about now – How about you? Let’s talk stress relief. What do you do to ease the stress this time of year? I have learned that I need to pencil in some “me” time at least weekly so that I can relax and refresh. “Me” time may be a trip to the gym to take my favorite Red Hot Dance class or a quick run to Starbucks for one of my favorite holiday drinks. I may hop in my car and take a drive listening to Christmas music and taking in all of the beautiful lights and festive decor, or I may simply enjoy some quiet time at home, wrapped in my favorite blanket in front of the fire, the TV turned to the Hallmark channel with a lovely candle burning and a warm cup of tea in hand. Even the simplest break is a coveted affair during these busy times. I just have to keep reminding myself to let go of the guilt and let my mind wander to a much calmer, stress free place. 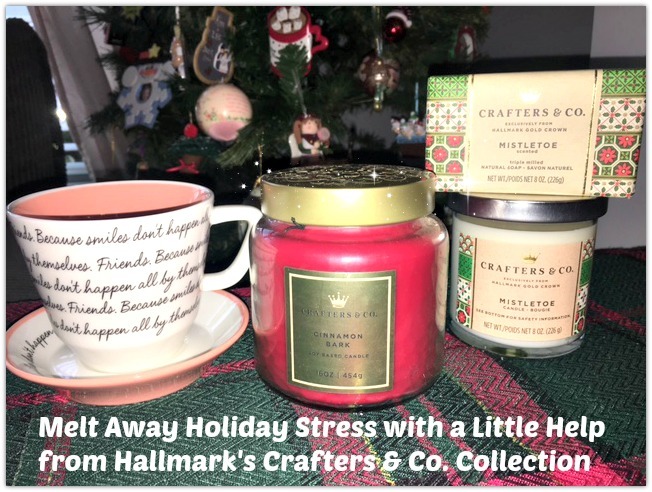 This year, I have had the privilege of partnering with Hallmark to review a few stress relieving products from their lovely Crafters & Co. line. Featuring teas, soaps, confections, cups and saucers, candles and more, the line offers all the makings for a delightful retreat – right in the comfort of your home. After receiving the box, that is exactly what I decided to do – create my very own spa-like experience – and boy was it a real treat! I began by pouring myself a piping cup of hot tea and enjoying it in this beautiful Hallmark Crafters & Co. Teacup and Saucer Set. This dainty teacup is absolutely darling. 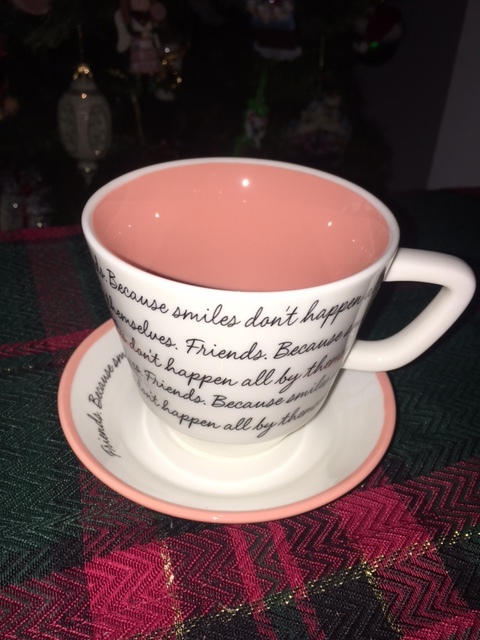 How can you not love the sweet saying which swirls around the cup and again around the saucer. A constant reminder of the importance of the gift of friendship, the powerful saying, “Friends. Because smiles don’t happen all by themselves” was all of the reminder I needed that despite the craziness of everyday life, my friends are always there to keep me up even on the most difficult of days. How wonderful would this be as a gift for your dearest friend or friends this holiday season? Next up, I drew myself a nice, toasty warm bath and lit my delightful Hallmark Crafters & Co. Cinnamon Bark Candle. This classic holiday candle evokes the nostalgic treat of vanilla sugar blended with buttery caramel, cinnamon and creamy vanilla. As delicious as a sinful treat minus the calories, I enjoyed the heavenly, fresh baked flavors of this soy based candle. I love the way it burns so evenly and evokes a soft, warm glow when you dim the lights and breathe in its sweet fragrance. Decorated with a beautiful floral swirl pressed design on its classy gold tone lid and a dangling golden snowflake around the neck of the jar as well as its festive holiday red color, I could definitely see this being the focal point of a lovely holiday gift basket, the perfect companion for a small gift card or a thoughtful present topped with a bow and a very personal hand written note. As a treat during my relaxing bath, I traded my trusty everyday soap for Hallmark Crafters & Co. Mistletoe Luxury Bar Soap. What a delightful treat for the senses! Made from certified sustainable palm oil, its cozy blend of red currants, cranberries, cedarwood, Frasier fir and embers is the perfect holiday de-stressing agent. 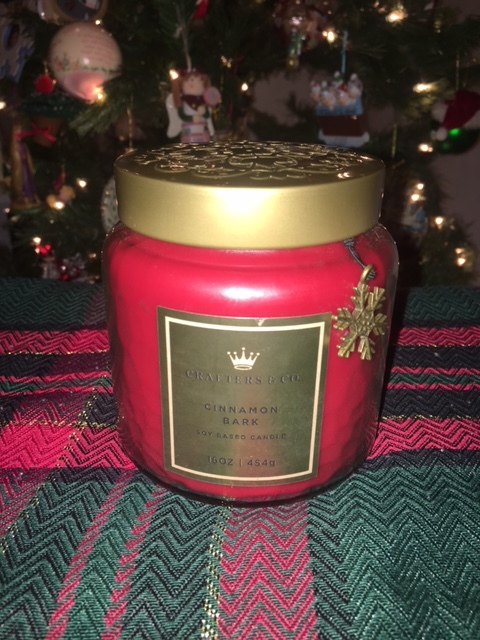 Its scent immediately reminded me of Christmas as a child and took me back to a happy place in time when the only stress I had was how long it was going to take me to fall asleep on Chistmas eve because of my excitement that “Santa soon would be there”! Ahhh – it is so amazing how such a simple experience can leave you so relaxed and rejuvenated! After my bath, I climbed into my favorite plush robe and slippers, headed downstairs, lit my Hallmark Crafters & Co. Mistletoe Glass Pillar Candle and turned on the Hallmark channel. Cozied on my couch under a blanket I watched Hallmark Christmas movies the rest of the night until I was ready for bed. I am pretty sure visions of sugarplums danced in my head as I slept as the cozy smells of Mistletoe had permeated my house with the most festive of scent and relaxed my mind and soul in ways I would not have imagined. I truly had the best night’s sleep that I have had in a long, long time. 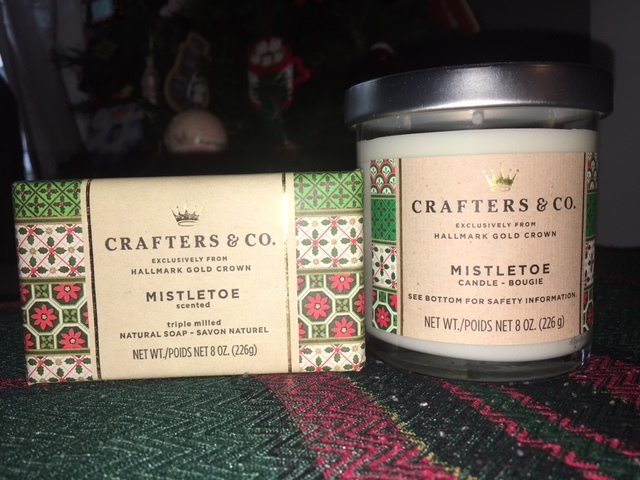 Since that evening I have been enjoying the scent of my Crafters & Co. Mistletoe candle daily; its natural vegetable wax blend burns cleanly (I have been told for up to 50 hours). It’s a beautiful way to lift your holiday spirit and infuse your space with the delightful scents of the season. As the Christmas holiday nears and it really gets down to crunch time, just remember to take a few moments for yourself to melt away the holiday stress. Give yourself the gift of “me” time, even if it is a short time out. You work hard to make everything just right – so take the time to treat yourself for a job well done! Because Hallmark loves the holiday season as much as we do, the lovely folks over at Hallmark would like to treat one very lucky Delco Deal Diva reader to their very own stress relieving Crafters & Co. gift pack. Simply enter via the easy Rafflecopter form below. Winner will be selected on December 21, 2016. Good Luck and Happy Holidays! The tart burners would make a great gift, I love that! bird tea cup and saucer set is gorgeous!!! I love all the Christmas scented candles and the Heritage collection ornaments! I’m also a fan too of the bird tea cup and saucer – so chirpy!! I would love to try the Crafters & Co. White Tea Ginger Candle, 4-oz. prep before and play music!! My favorite tips to combat holiday stress is a nice warm bath. It helps me. I like The Taupe Medallion Wax Melt Warmer. I love the Taupe Medallion Wax Melt Warmer. Did I read “Stress relieving gift pack”??? Sign me up, please!!! Love Hallmark! For me the best tip to combat holiday stress is to just take your time, breathe! Enjoy it! My favorite item is the Taupe Medallion Wax Melt Warmer. Thank you for a great giveaway. My family sets aside time each week in December to gather and focus on our Reason for the Season. I try and combat stress by prayer! Edye recently posted…5 Ingredient Protein Cookies!